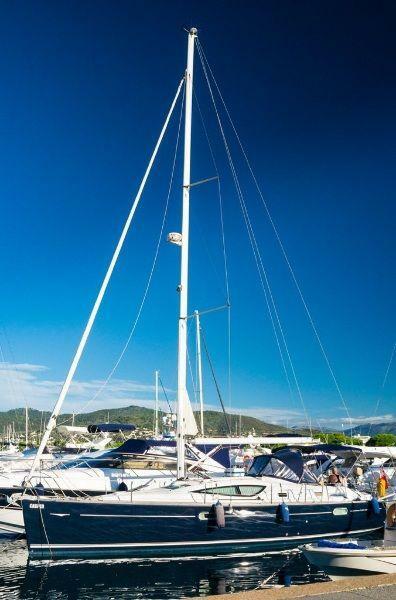 Comfortable deck saloon 42 ft. yacht situated in Camille Rayon Marina, Golfe Juan, France (mooring also separately available for rent or purchase remainder of lease). 2 spacious cabins each with their own electric head. Fully equipped galley, TV in saloon and both cabins + Bose sound system. This boat is set to sail single handed with furling mainsail, electric winche, radar, Raymarine plotter and Comar AIS. 2 Plastimo 135 Binnacle compasses, Raymarine 240E VHF radio. Raymarine ST60 Wind. Log, Tridata, Depth. Multifunction GPS chart plotter. Lower helm repeater. Autopilot (Raymarine St6002) Comar AIS system. Refrigerator (with small freezer section), Microwave oven, Main oven and gas rings for cooking. Large smart TV in saloon and 2 small TVs in cabins with remote operation. DVD, radio and CD player connected to BOSE sound system for cockpit and/or saloon/galley, various teak holders for glass storage. Each cabin has a hanging wardrobe and various lockers for storage. All hatch covers have been replaced in the last 3 years with black out/bug sliding capability. 6 Plastimo life jackets under starboard sofa.